This is a separate post for the two Shadows On the Moon updates I made while reading it. They are quite wordy, so both merited a post separate from the official review. On my fourteenth birthday, when the sakura was in full bloom, the men came to kill us. We saw them come, Aimi and me. We were excited because we did not know how to be frightened. This was quite the introduction and goes to show that this isn't going to be a typical fluff of a YA fairy tale retelling. Within the first few pages, in the first chapter alone, two of Suzume's loved ones are slaughtered for no reason save for alleged treason. I have a feeling I'm going to like this one. And there were some pretty solid reviews about this book, which is what motivated me to consider it in the first place. It's also an Asian-themed book, which I'm always drawn to (for obvious reasons), but of which I always tend to have reserves about reading. This one is Japanese-themed, though, and I'm not sure if I would know whether or not the references are appropriate (since I'm Chinese). Nonetheless, whether the summary, the introduction, or trusted YA reviewers opinions, I'm intrigued with this book enough to want to read it. Also, I'm currently still riding a YA high fantasy "high" after finishing Fire and Thorns series and am needing something to help me move on from that hollow, float-y feeling you always get after finishing an epic-ly awesome series. So I'm hoping that something revered as equally YA epic will help. Part 1 of Suzume's life has come and gone and if it's any indication based off of the title of the second part of Shadows on the Moon, Suzume now begins the next part of her life (and her journey) as a little fake servant girl named Rin. The story line progressed at an amazingly smooth pace, detailing all the conflicts and issues surrounding Suzume's father's death and the following time that she and her mother spend living with Terayama-san. 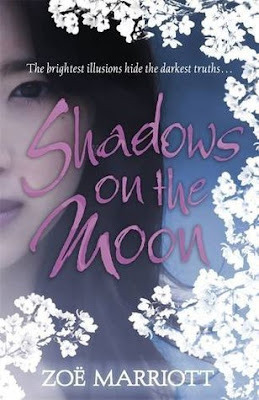 The writing and the imagery is beautiful and I love that the magical aspects of shadow-weaving just seems to come so naturally--both as a plot point and as a magical skill used by Suzume. While it seemed as if we spend a lot of time just watching Suzume "live" quietly as an invisible presence in her step-father's home and being pushed away by her own mother who craves attention from her new husband and seems to loathe if it is given to her daughter instead, a lot seems to have happened along the journey as well. Suzume learns to use her shadow weaving skills, we get to hear about some legends, and we meet a bunch of foreigners who may or may not also know how to use shadow weaving. We learn a lot about Terayama's and Suzume's mother's personalities (and those two definitely deserve each other and Suzume just needs to find a way to run away). Anyway, my quick update probably doesn't do this book much justice, but I'm extremely excited about reading the rest of the story to see where Suzume's journey leads her next as the little servant girl covered in cinder and ash, Rin. These updates were originally posted at Ani's Book Abyss / BookLikes in August 2014.